Time to dust off your old cookbooks and find inspiration from their time-weathered pages. You may even surprise yourself. 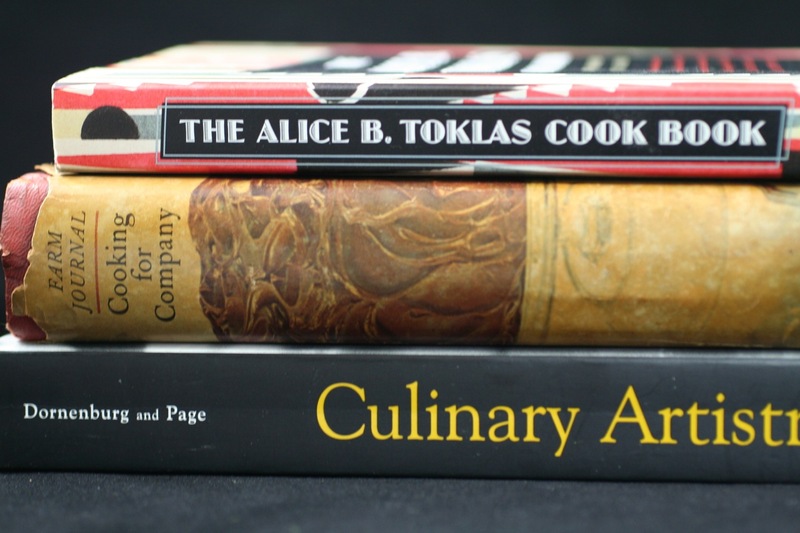 Culinary Artistry by Andrew Dornenburg and Karen Page (Wiley 1996). The precursor to The Flavor Bible, their wildly popular compendium of flavor pairings, Culinary Artistry is also chockablock full of great advice on how to pair flavors. You look up an ingredient, say artichokes, and discover, in varying degrees of compatibility, what other foods and flavors go well with these springtime veggies (the best ones are anchovies, garlic, hollandaise sauce, lemon, and vinaigrette). 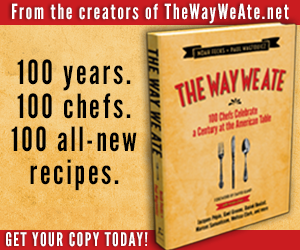 It also offers favorite recipes culled by top chefs from that era. Cooking for Company by the Food Editors of Farm Journal (Doubleday 1968). These are simple recipes you’d expect from that era. Lots of margarine, shortening, and other processed foods ramp up the nostalgia. It’s for the housewife who wants little fuss so she can still get all her morning and afternoon chores done before the kids get home from school and daddy parks his tractor. On one page you’ll be tempted to make Lima Beans with Cheese (“Try Gruyère instead of the Cheddar or Swiss for a flavor change”). On another, Party Pork Rolls, made with both fresh and smoked ham. Euphoria and brilliant storms of laughter; ecstatic reveries and extensions of one’s personality on several simultaneous planes are to be complacently expected. 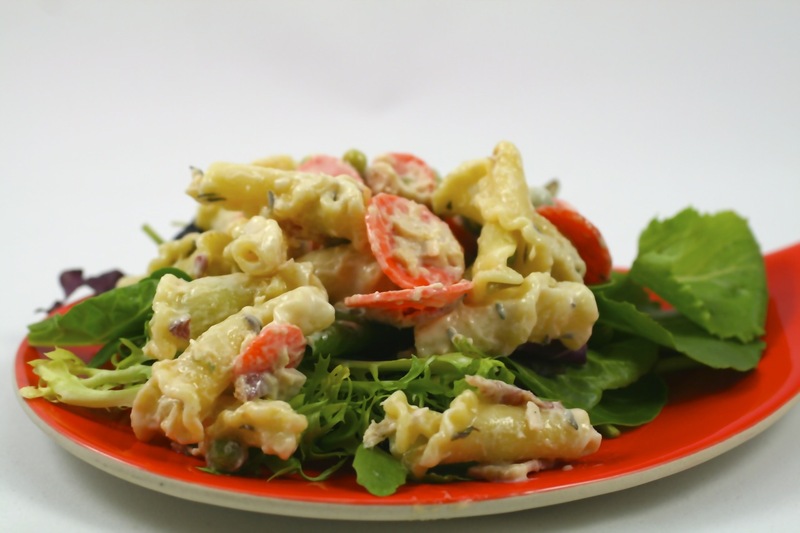 Tuna salad can be so boring, but not with the addition of the Best-Ever Salad Dressing. Combine a little mayonnaise with anchovy paste to blend thoroughly. Stir in remaining mayonnaise and other ingredients. In a small bowl, mix salt, pepper and dry mustard; stir in vinegar and honey. Slowly add the salad oil while beating with a mixer. I used an immersion blender. makes about 1 1/3 cups. Combine ingredients and adjust seasoning to taste. Serve over a bed of lettuces. 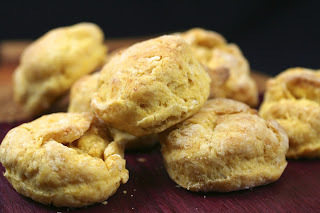 With a lone sweet potato waiting patiently to be transformed, Paul opted for a recipe for Sweet Potato Biscuits in Cooking for Company to go with the leftover Spiced Pork Loin that had been the inspiration for the last few evenings’ dinners. 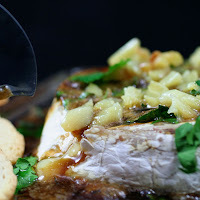 They came out the color of sunflowers, and were a little fluffy, a little crumbly, and, when drizzled with a little honey and lightly swiped with creamy butter, more than perked up the spiced pork. Preheat oven to 400˚F. Sift together dry ingredients. Cut in shortening. Blend in sweet potatoes. Add enough milk to make a soft dough (this will depend on moisture in potatoes, so add one tablespoon at a time). Knead lightly, folding it several times to create layers (do not overwork dough). Roll 3/4" thick on lightly floured surface. Cut with floured 2" cutter. Place on ungreased baking sheet and bake in hot oven for 20 minutes, or until the biscuits have browned. Makes about 15–20 biscuits, depending on diameter of cutter. 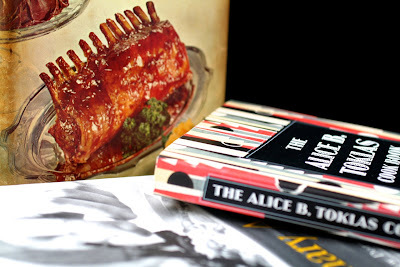 We’re still reading the Toklas book and are finding fun recipes on every page. Now it’s your turn. Dust off those cookbooks and find inspiration now. Cutting into a hunk of baked Brie is almost as satisfying as eating it. Do you remember when Brie was exotic? It was the early 80s. Preppies and their imitators were throwing lavish cocktail parties. Making a beeline for the buffet table, you saw trays lined with bready canapés and wheels of white-encased soft cheese. “It’s called Brie. It’s French and delicious,” you heard your mom, the hostess, declare. “Try some before the guests arrive. Then scoot.” So you loaded up your small plate with these pretty hors d’oeuvres, and, when she wasn’t looking, you tipped a little champagne into a cup and hightailed it back to your bedroom. But when you got to your teen sanctuary, you looked down at the canapé plate and noticed that your slice of Brie was encased in a rind that seemed a little unfriendly. Do you eat the rind or try to extract the creamy center? You try both, and realize it’s much easier to shove the whole thing, rind and all, into your mouth. Buttery mixed with tangy. Not bad. As time went on, you started noticing something called baked Brie at your TGI Fridays. 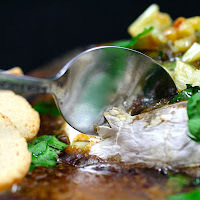 It came to the table hot and perhaps coated in a jamlike spread with some herbs. You cut into it and out flowed its creaminess. You devoured it, emitting a few occasional grunts of satisfaction. But had Brie really ever left, or was it marginalized to the realm of nostalgia, desperately looking for a way back into the world of acceptance? 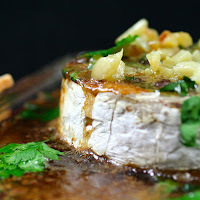 When we visited Steve’s sister this New Year’s Eve, she served a simple hors d’oeuvre of baked Brie with a generous glaze of butter, brown sugar, fresh parsley, and garlic. It’s not the prettiest dish to arrive at the table, but what it has going for it makes it survive the decades: flavor, simplicity, and, well, it’s melted cheese. 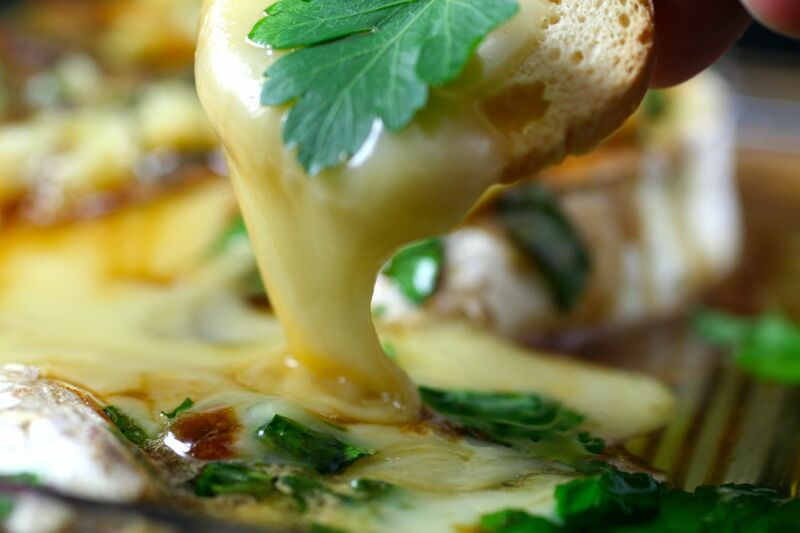 Because Hot Brie Dip is so simple to make, it’s the perfect thing to bring out of the oven when most of your guests have arrived. Serve with airy, buttery crackers or toast points. Try it with other chopped fresh herbs, such as tarragon or chervil, if you prefer. And mellower roasted garlic in lieu of the pungent zing of raw might be a substitution you’re willing to try if you have the time. Pair with something that reminds you of sitting at a bistro. A French 75 or a Kir Royale may be just what the médecin ordered. About the alternate “aka” name you see below: Carol later confessed to Paul that she got the recipe from her sister-in-law, so we colloquially refer to it as Sister-in-law Brie, or Brie à la Belle-sœur, if you want to sound poshly gourmet. Preheat oven to 350ºF. Place Brie wheel in a baking or pie dish and set aside. Melt the butter in a saucepan. Add the brown sugar, parsley, and garlic to the butter and mix together. Pour over Brie wheel. Bake in oven for about 20 minutes, or until the Brie is soft to the touch (it will give when you press on it). Cut into Brie as if you were cutting a slice of pie. 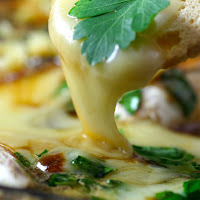 It will ooze its creamy center, which will mix with the other ingredients. Sprinkle with fresh parsley leaves. Serve with crackers or toast points. If you have a garlic roaster, great. If not, get out the aluminum foil. Cut the top off the garlic bulb, exposing the cloves. Place garlic on roaster or aluminum foil. Drizzle about a tablespoon of olive oil and coat evenly. Cover or wrap. Place in center rack of cold oven and turn to 400ºF. Bake for about an hour. Turn off heat and remove from oven. Remove garlic bulb, and place roaster and lid back in oven, if you’re using a terra cotta roaster, to prevent cracking. You can now extract the cloves from the bulb.